The Science Behind Pixar exhibition has been designed to let visitors experience the art, science, computer science, and math that Pixar uses to create their groundbreaking films. The resources on this website can help you make the most of a visit to the exhibition, or to find ways to incorporate the science behind Pixar into your classroom directly. Learn about technical challenges Pixar faced and the math, computer programming, or science they used to solve it. Watch interviews with Pixar employees who describe their work, the skills they use, and their career journeys. Create a virtual 3D model of a toy person from simple 3D shapes (cube, cone, cylinder, and sphere). Use customized software, to create, rotate, move, and scale your shapes to make a complex virtual 3D model. 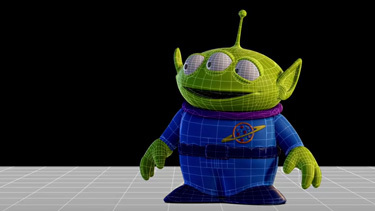 Select one of three Pixar characters and choose among four arm rigs to determine which will produce the desired motions. Edit appearance variables (color/pattern, bump map pattern and height, transparency, and reflectiveness) to design a virtual sphere on the counter of the kitchen in Ratatouille . Generate a field of grass by adjusting color, clumpiness, height, and bend direction of each blade. A randomness selector determines whether the objects are mostly alike or mostly different. Create a short animation of Mike Wazowski waving. Select a transition curve and set the total number of frames. Adjust sliders to change the rules governing the motion of fish for Finding Nemo . Vary the distance between fish, the number of groups, and the desire to match the direction of other fish and see the effects on an animated scene. Control some of the factors that effect the render time of an image from Ratatouille. See how increasing the size of a crowd or the sample rate change both the quality of the image and the amount of time it takes to render the final image. This collaboration between Pixar Animation Studios and Khan Academy is a series of interactive lessons, each of which demonstrate how a concept introduced in school is used for creative benefit at Pixar.